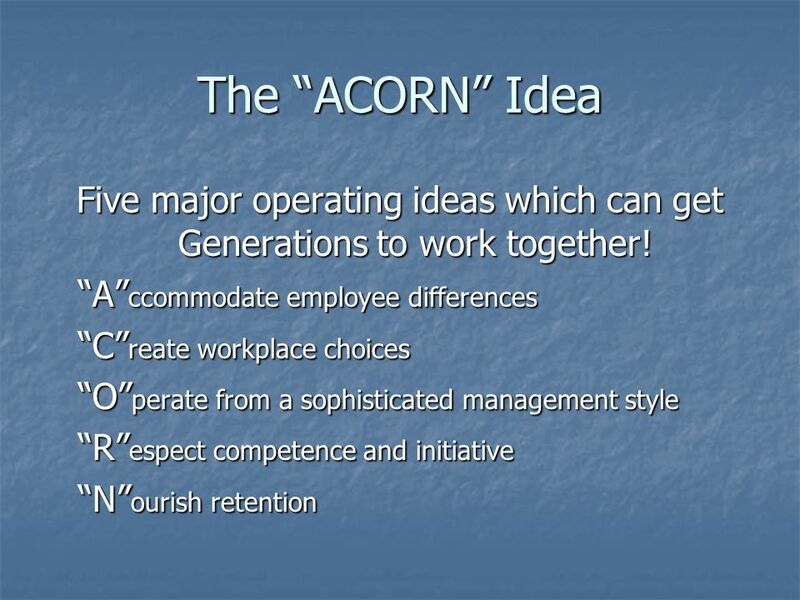 Generations at Work in your workplace! Who are those that were born between 1922 and 2000AD? Cynthia A. Jennings WBL Coordinator. 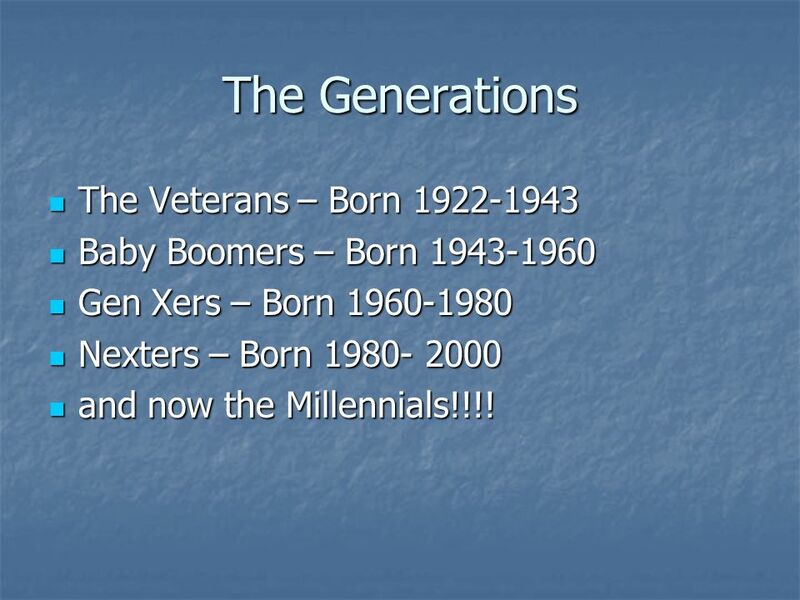 2 The Generations The Veterans – Born 1922-1943 The Veterans – Born 1922-1943 Baby Boomers – Born 1943-1960 Baby Boomers – Born 1943-1960 Gen Xers – Born 1960-1980 Gen Xers – Born 1960-1980 Nexters – Born 1980- 2000 Nexters – Born 1980- 2000 and now the Millennials!!!! and now the Millennials!!!! 13 Understanding the Team idea! 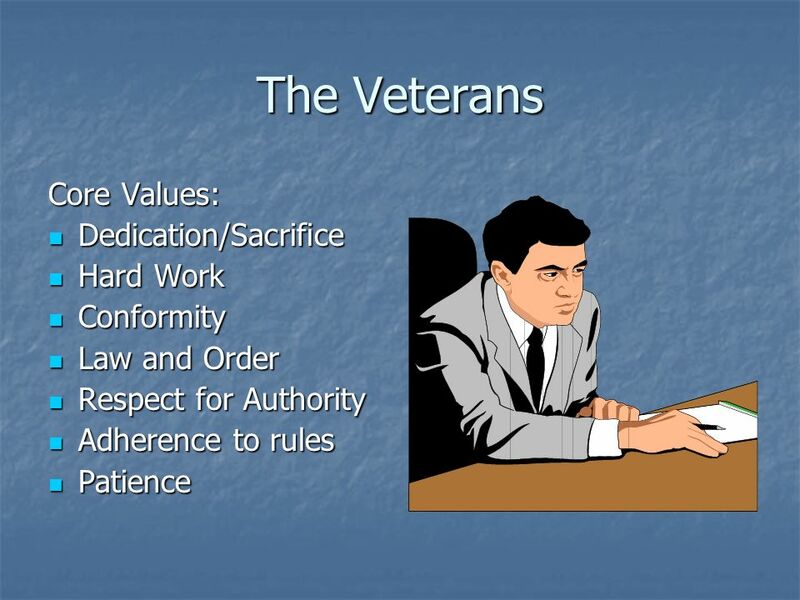 The Veteran: Teams with strong leaders who told them exactly what to do, how and when. 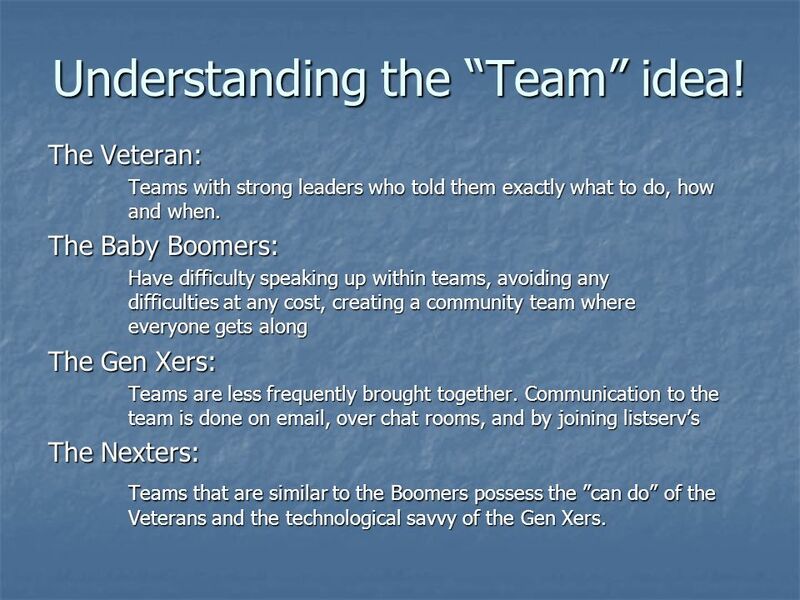 The Baby Boomers: Have difficulty speaking up within teams, avoiding any difficulties at any cost, creating a community team where everyone gets along The Gen Xers: Teams are less frequently brought together. 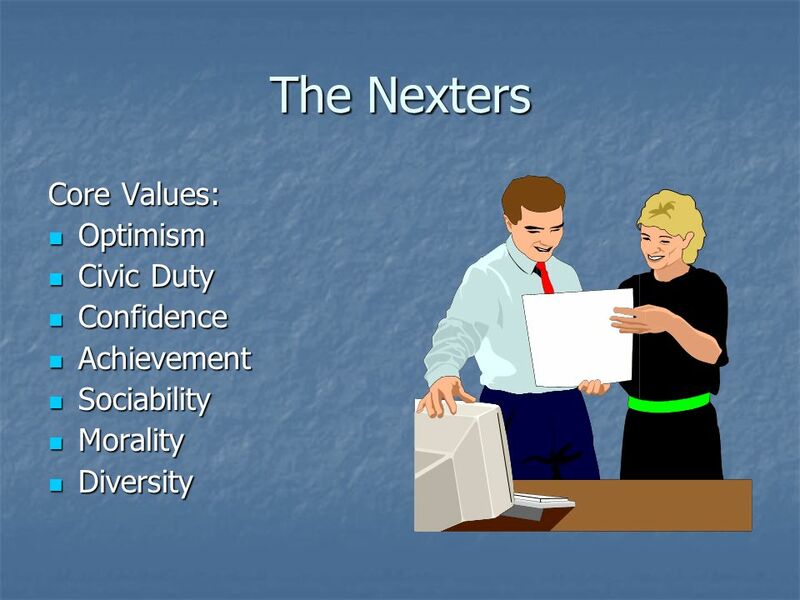 Communication to the team is done on email, over chat rooms, and by joining listservs The Nexters: Teams that are similar to the Boomers possess the can do of the Veterans and the technological savvy of the Gen Xers. 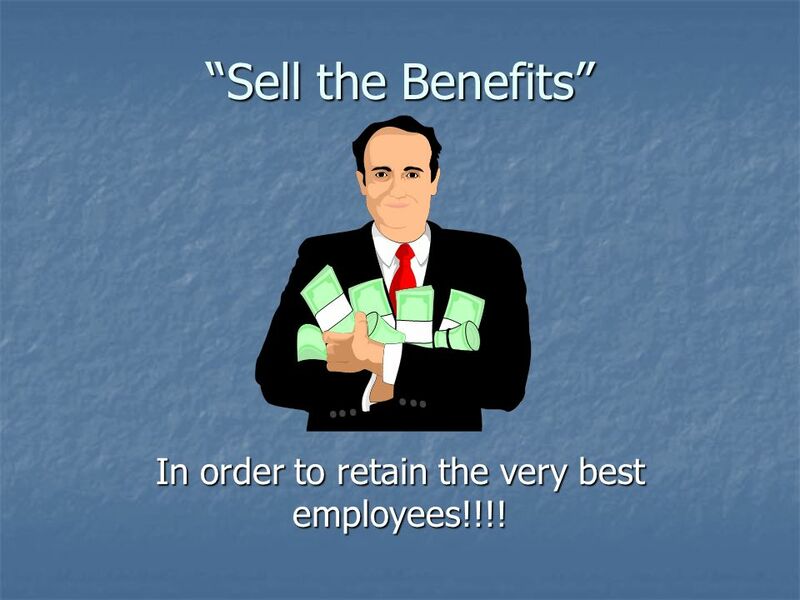 20 Sell the Benefits In order to retain the very best employees!!!! 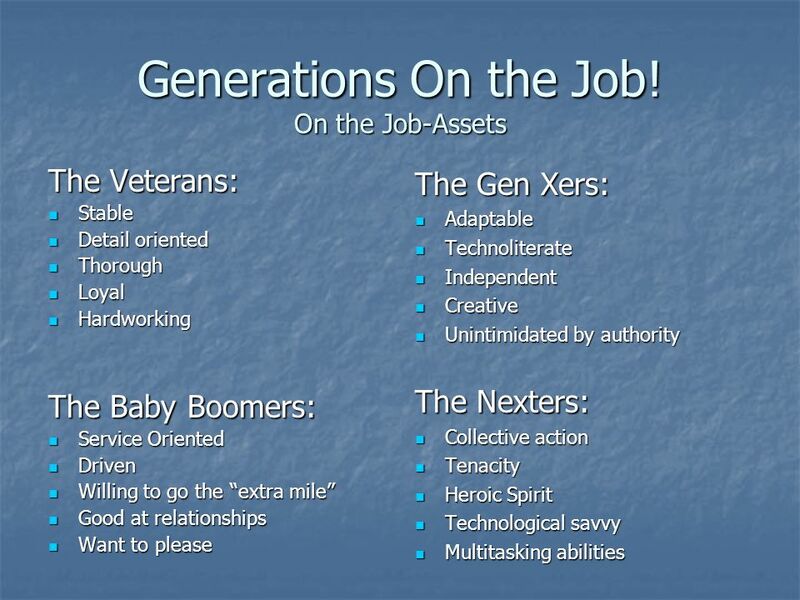 Download ppt "Generations at Work in your workplace! 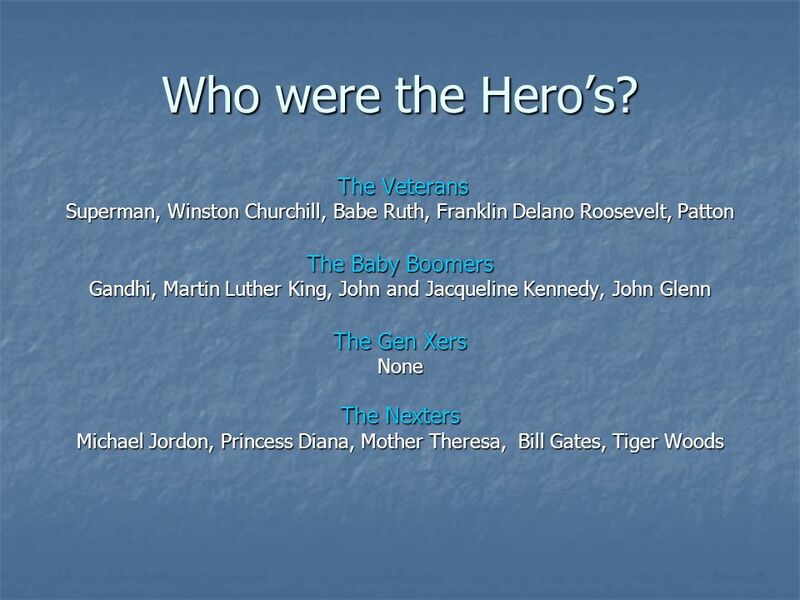 Who are those that were born between 1922 and 2000AD? 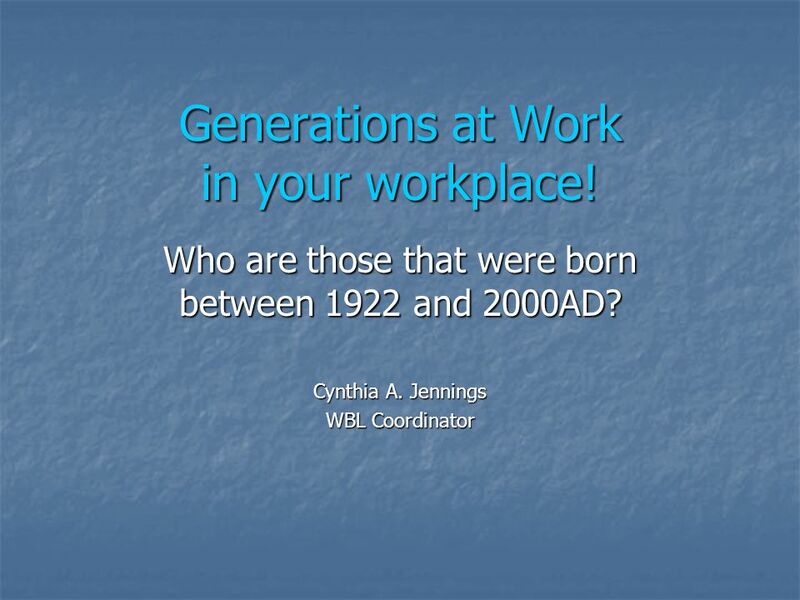 Cynthia A. Jennings WBL Coordinator." Developing Leaders Around You: Getting young AAOS fellows involved in their state orthopaedic societies American Academy of Orthopaedic Surgeons State. A Successful Multi-Generational Work Environment (From Backpacks to Briefcases) Megan Martin Training/Development Coordinator University of Missouri Extension. 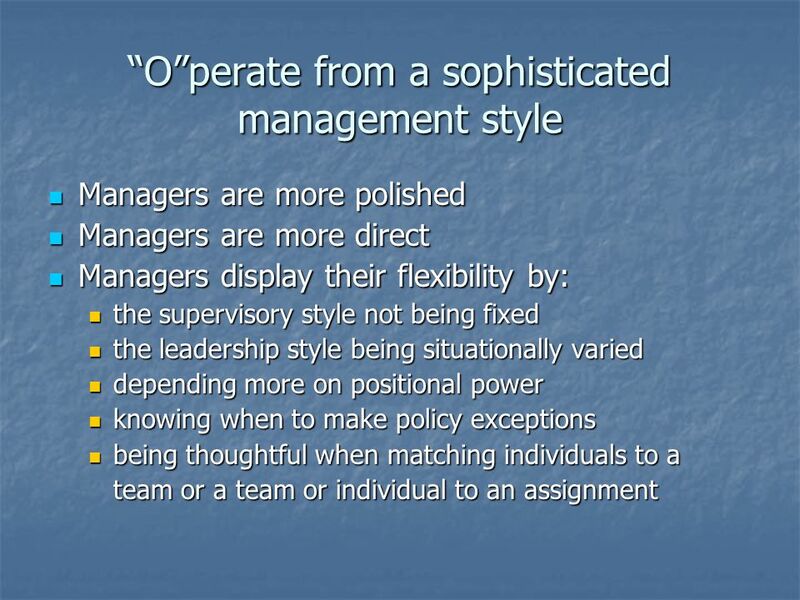 Department of Management Generations in the Workplace Dr. Michael Wesson February 29, 2012 HR Liaison Network Meeting. NAW Large Company CEO/COO Roundtable Today’s Challenges: Investing In People What Are Your Potential Employees Looking For? 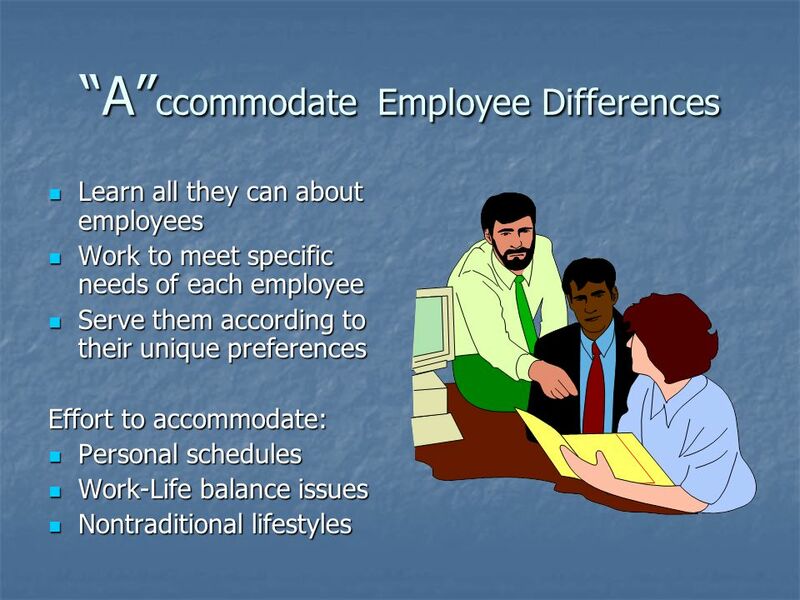 Howard Coleman MCA Associates. Presented By: Michelle DiTondo Sr. Vice President Human Resources Presented By: Michelle DiTondo Sr. Vice President Human Resources Effectively Engaging. Bridging the Gap Reaching the Next Generation of League Leaders. 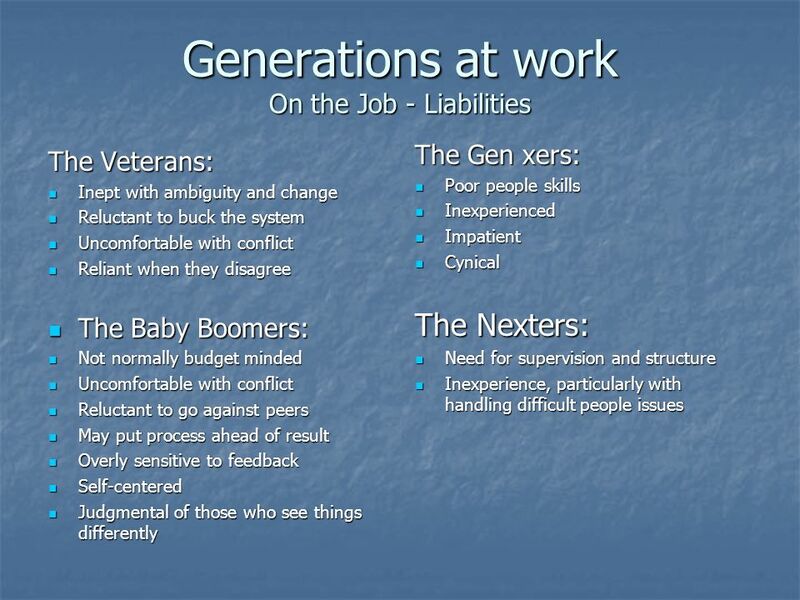 1 From the Silent Generation to the New Millennials Generational Differences in the Workplace January 10, 2014. 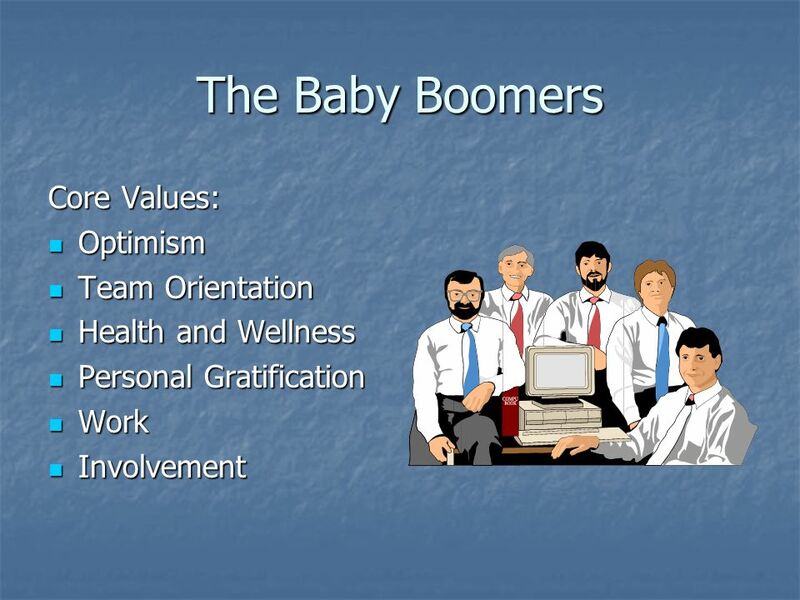 Or… Breeching the generational divide to enhance collaboration in order to improve instruction. Closing the Generation Gap Nancy Barry Speaker – Author – Gen Y Expert nancybarry.com Author of When Reality Hits: What Employers Want Recent College Graduates. 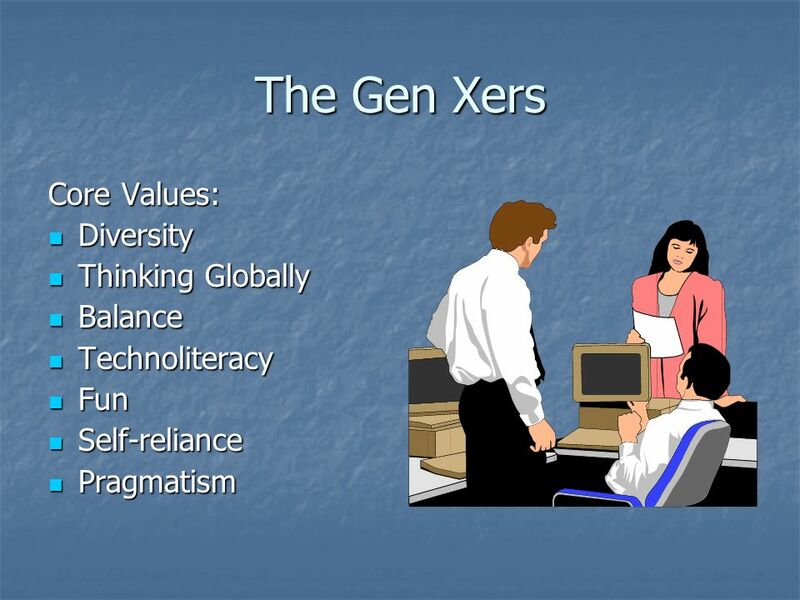 Baby Boomers Gen X & Gen Y How do we work together? 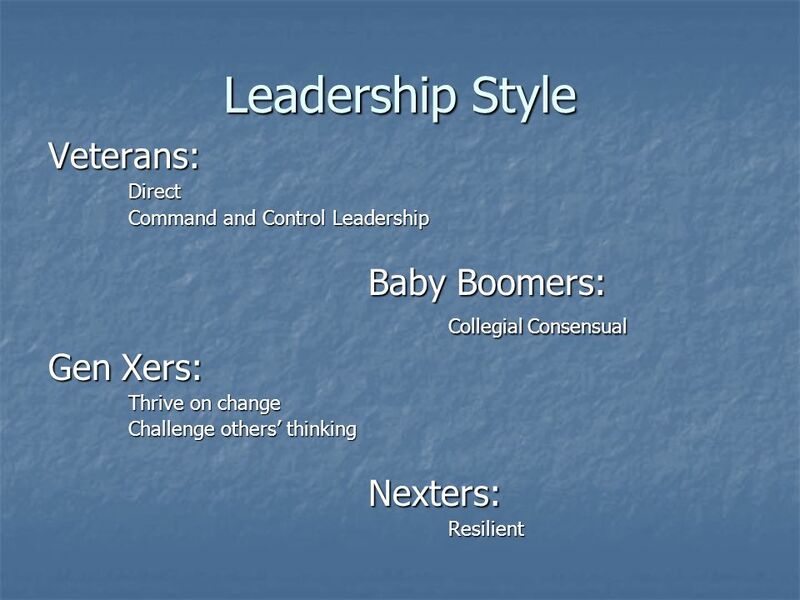 Pink Hair in a Land of Bifocals Managing the Generations in the Workplace. Gen Why?. Defining Events Great Depression WW II Age of Radio Silver Screen Traditionalists: 64 – 87 years old Attitude/Values Loyal Respect. 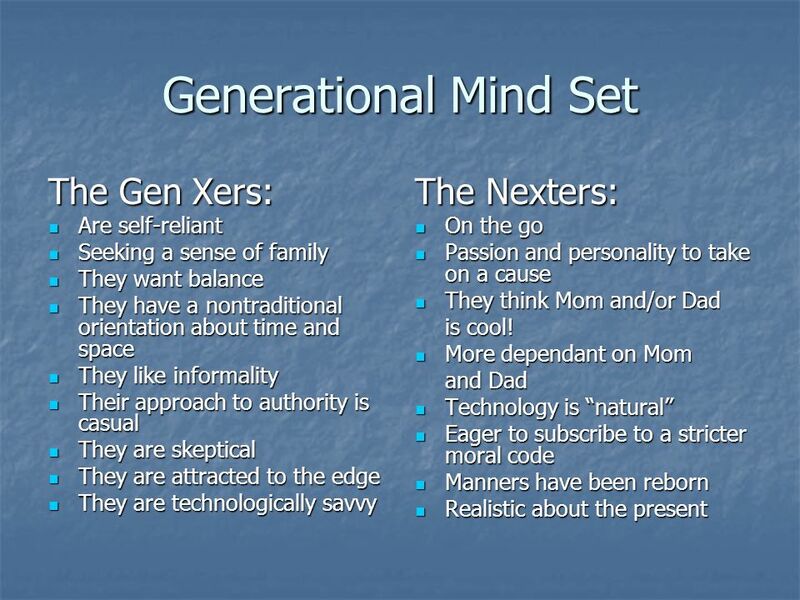 The Different Generations. 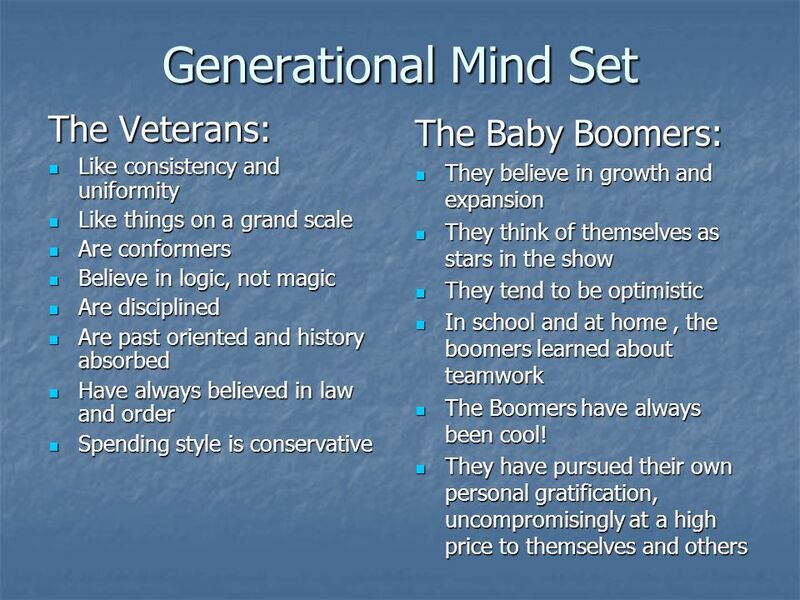 Generations GenerationsVETERANBOOMER GEN XER GEN YER Dates Between Between Between.